As a huge fan of the Han Cholo x Star Wars collection of jewelry, I was very excited when they added four stud earring designs to the range. First released in precious metal versions (sterling silver and vermeil) in September last year, they were soon available in the ‘Shadow Series’ of stainless steel versions in October. 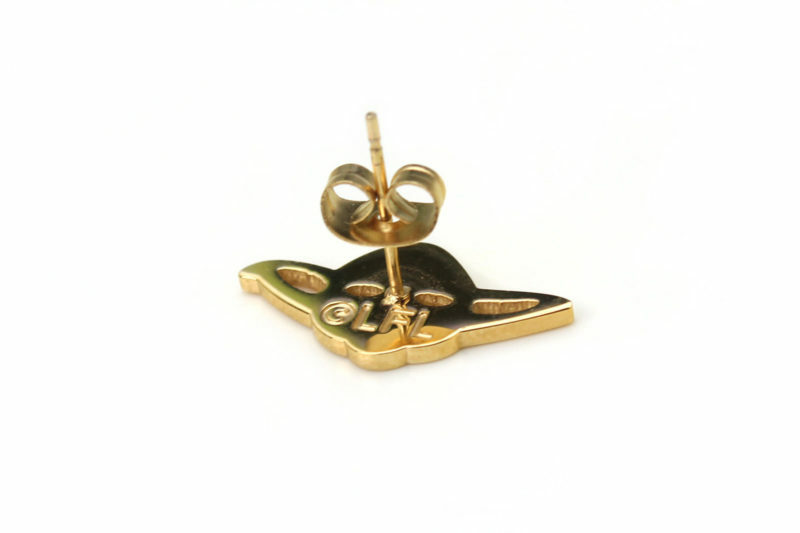 I really appreciate that Han Cholo gives fans options for their range – sterling silver is nice, but not every fan can afford precious metal jewelry – and the lower price point of stainless steel means you can buy more pieces from the range! 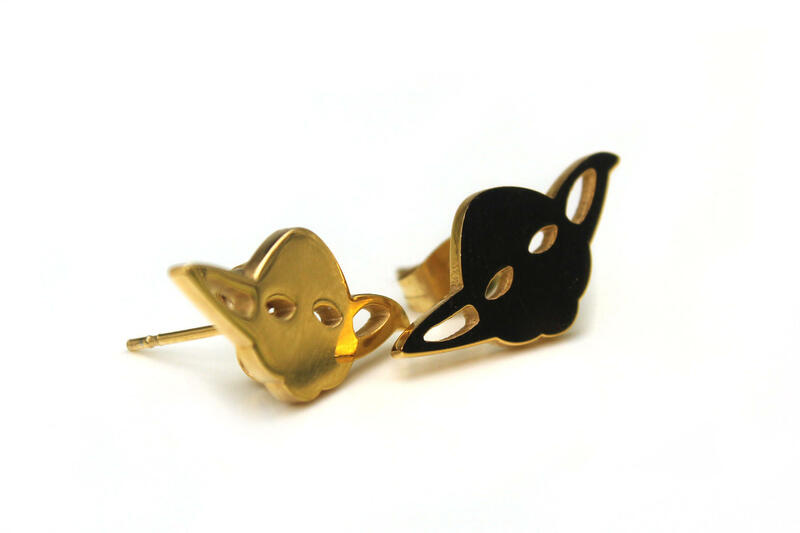 The Han Cholo x Star Wars Yoda stud earrings are available to pre-order from Entertainment Earth, priced at US$29.99 per pair (stock due to arrive later this month). To celebrate May the 4th, Entertainment Earth has a great promotion on their range of Han Cholo x Star Wars jewelry – buy one, get one 40% off! Be quick – the promotion lasts until May 10th, while stocks last (40% off applies to the item of lesser value – full promotion details here). Entertainment Earth has a great range of Han Cholo jewelry to choose from – check out their full range here. 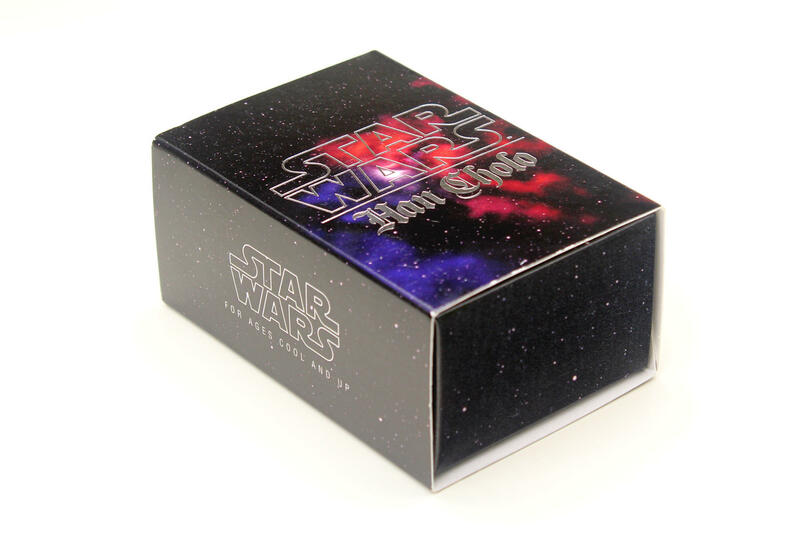 The Yoda stud earrings come packaged in a ‘drawer-style’ black gift box, which features an all-over starry sky background, with the Star Wars and Han Cholo logos embossed in silver on the front. The back of the box has smaller logos printed in white, this time with website addresses, together with the Disney logo and the text ‘For Ages Cool And Up’. 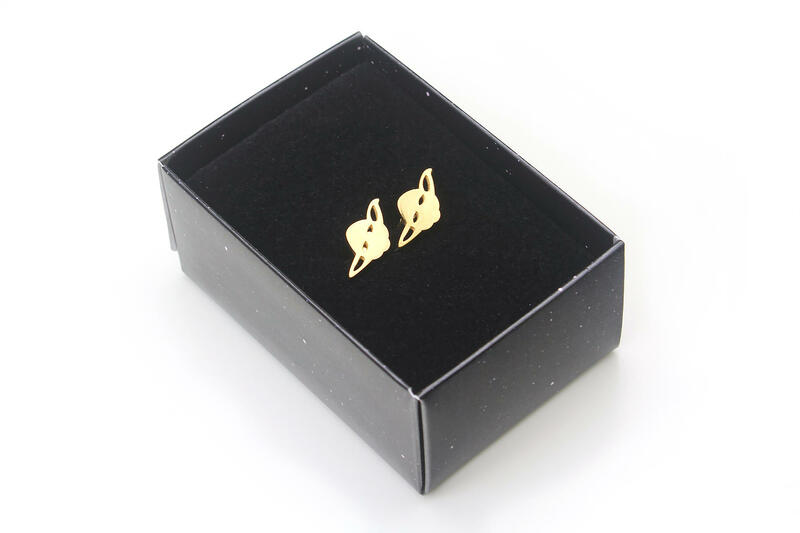 The earrings sit on a foam square inside the box (the foam has a black velvet top layer), with the earring posts inserted into a slit in the foam to keep them in place. 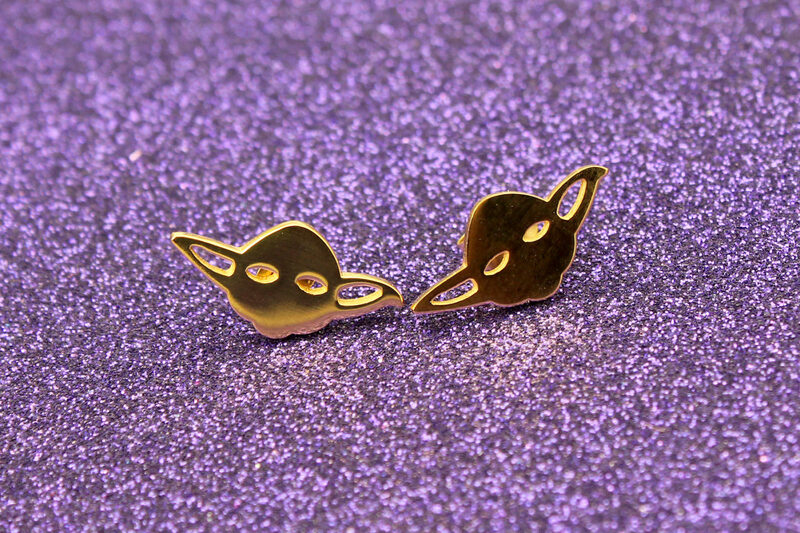 The Yoda stud earring set includes two stud earrings, and are available in a silver-tone or gold-tone finish – these are the gold-tone versions. For me, I prefer the gold-tone choice for Yoda, as it feels more complimentary to his color scheme of green skin and brown robes. I usually prefer silver-tones for my jewelry, so it’s great that Han Cholo gives fan a choice of finish. The earrings are made from stainless steel, but the packaging does not mention if the gold-tone is actual gold-plating, so I’m not sure – it does have a convincing gold finish. 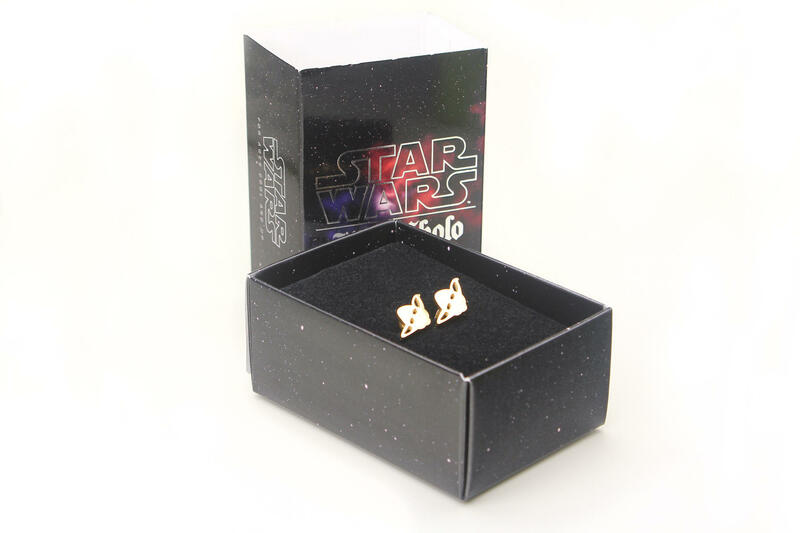 While so many styles of Star Wars character earrings use a 3D sculpt, these Han Cholo earrings use a flat stencil design. The simpler design is both subtle and bold, an unusual combination. Having less detail on Yoda’s face makes it less recognisable to those not familiar with the character, but at the same time the shiny gold-tone surface draws your attention. The flat surface is far more reflective than a 3D sculpted item, so it really catches the light and stands out despite being a small item. I absolutely love this modern design, the cut-outs give just the right amount of detail. These earrings use ‘butterfly’ style earring backs, which are by far my favourite stud earring style. The posts have a ‘notch’ near the end, which helps prevent the backing from sliding off, which makes them very secure to wear. I have no fear of these earrings coming out while wearing, which is rather important for stud earrings. The earrings measure approximately 20mm across (‘ear’ to ‘ear’), and approximately 10mm high. 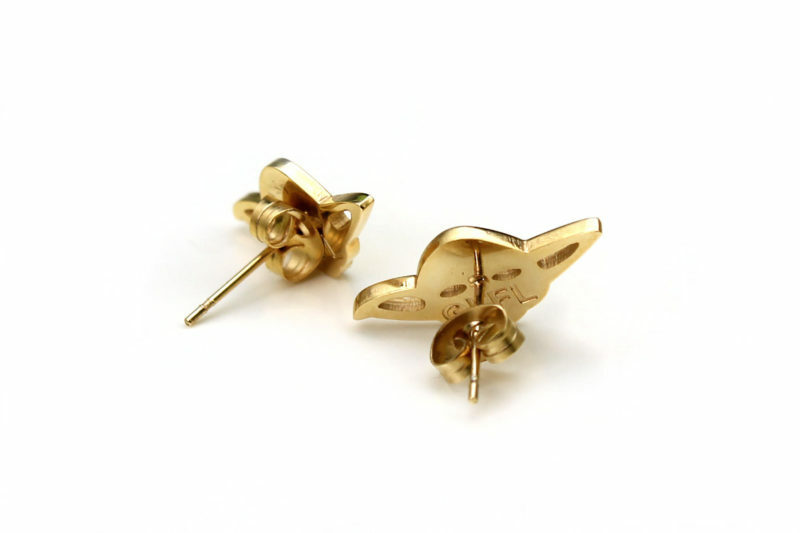 The back of each stud earring is stamped with ‘(c)’ LFL’, noting these are licensed items. So many stud earring designs use Star Wars symbols, or Imperial characters like Darth Vader or Stormtroopers – so it’s nice to see a jedi character like Yoda being featured for a change. 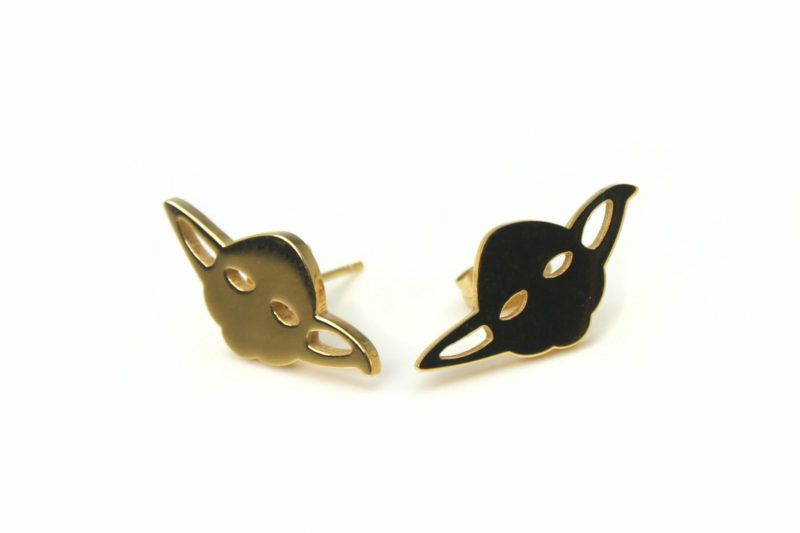 I love a nice pair of earrings you can comfortably wear all day, without worrying about them slipping out – this stylish Yoda design can be worn for any occasion. Disclaimer: this item was supplied by Entertainment Earth for review purposes. 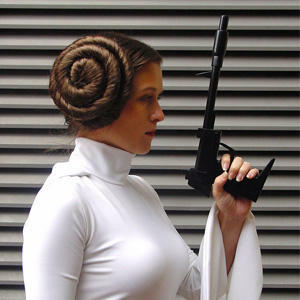 The Kessel Runway stands by the position that this, and all of our reviews, are an honest analysis and opinion regardless of whether the merchandise was purchased or supplied by a manufacturer/retailer.